Ofsted inspectors have said there are "serious concerns" about the standard of education at a new city academy. A report on the West London Academy, in Northolt, says there are "pockets of good practice". But punctuality and behaviour are problems, and the rate of exclusions "extremely high". Staff and pupils are due to move into new buildings next term and the academy says it will be a success. The academy, one of the government's new independent state schools, began operating under its new name in September 2003. 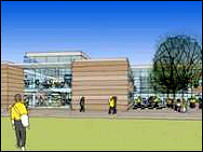 It is replacing Compton High School and Northolt Primary School, and is due to open fully from next September. Ofsted carried out a two-day monitoring visit at the end of June. The inspector, Boyd Gunnell, reports that many of the pupils are "reticent learners", often passive in lessons and prone to losing concentration. Each year group was "a crucial mass of pupils whose functional reading age is critically below that expected for their age". In general behaviour was appropriate. But he says: "The defiant attitudes of a small number of pupils is a cause for concern." The rate of exclusions was "extremely high": 265 fixed-term exclusions this year, more than treble the previous year, and 20 pupils permanently excluded. The curriculum was unsatisfactory. And its specialism - supposedly enterprise - "is not evident in its provision". The principal, Alastair Falk, had "a clear vision" but crucial areas of his leadership and management were unsatisfactory. Senior managers had a good grasp of what was required to improve, and many of the teaching staff were strongly committed. But Mr Gunnell concludes: "This visit has raised serious concerns about the standard of education provided by the academy and I am recommending an early return visit." The academy's sponsor and chair of governors, Professor Alec Reed - founder of the recruitment group Reed Executive - said it was obvious there was much to do. But the school faced "one of the toughest educational challenges in the country" and needed time. "Apart from academic achievements this year there has been a growth in extra curricula activity, and the academy has won prizes for art and for dance, and are regional football champions," he said in a statement. "Make no mistake, it will succeed." The principal, Mr Falk, said the task had been enormous and it took probably five years to turn around a failing school. "There is also plenty in the report that is very positive - for example the students themselves are quoted as seeing real improvement over the last two years." Parents supported the exclusion of disruptive and threatening students, he said. "Why should a handful of young men and women spoil the chances of the great majority of our students? "The government, you know, can't have it both ways - it preaches zero tolerance, but then we are rebuked for exclusions."